processing of the obtained alignments to perform the different analysis. nextpresso has been designed for execution on HPC, scheduled by an SGE system or by a PBS system. Although sequential execution in a single workstation is also allowed. PathJam is a public tool which provides an intuitive and user-friendly framework for biological pathway analysis of human gene lists. This server integrates pathway-related annotations from several public sources (Reactome, KEGG, Biocarta, etc) making easier the understanding of gene lists of interest. 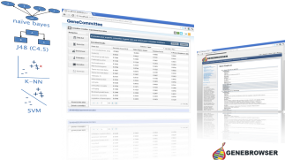 GeneCommittee is a web-based interactive tool for giving specific support to the study of the discriminative classification power of custom hypothesis in the form of biological relevant gene sets. Provided with a straightforward and intuitive interface, GeneCommittee is able to render valuable information for diagnostic analyses and clinical management decisions based on systematically evaluating custom hypothesis over different data sets using complementary classifiers, a key aspect in clinical research.